WeeHoo All Weather Canopy 2014 - fits all Weehoos and Blasts (including 2016 models). The all weather cover offers excellent protection from both sun and the rain. During poorer weather conditions the clear front cover can be zipped down to give protection from the rain. The top is made from red material to offer sun protection and all the sides are clear to provide good visibility for the child. The all weather cover easy to attach or detach using four plastic clamps and folds away nicely. 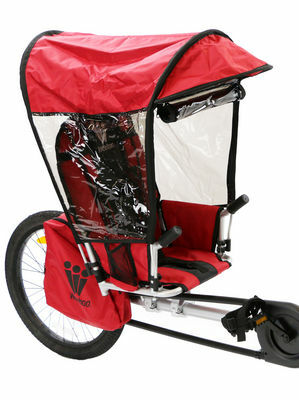 It can be used with the iGo Pro, iGo 2 or iGo Venture.